The most anticipated night of the year is nearly upon us and along with what to do and where to go comes the agonising decision of what to wear. Whether you're staying in, heading out on the town or going for something in between - here is some outfit inspiration to calm the pre New Year's eve 'what do I wear?!' nerves. If you're heading to the club this New Year, you'll want a showstopping dress. This navy number will nip you in at your waist and with a kicked out skirt will make you feel the belle of the ball (well club, but you get the gist). Team with some platform heels - believe me you'll thank the shoes for the platform comfort factor at the end of the night, and throw on a classic black blazer to complete the look. If your night in is set to be less rowdy, rejoice in comfy clothes. Team some statement slippers with an oversized polo neck dress. 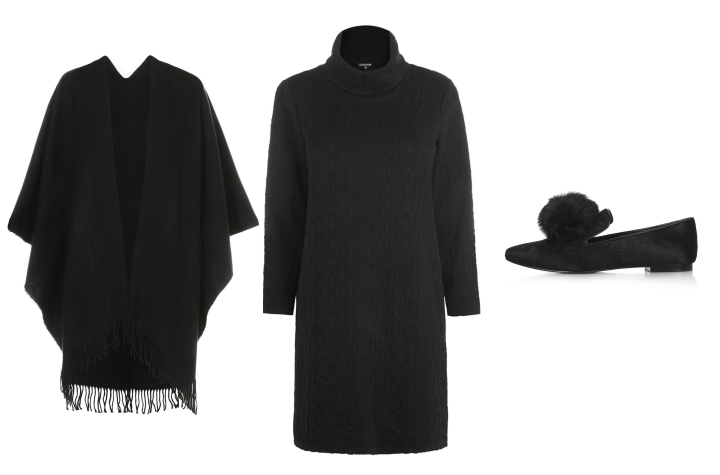 And for extra warmth throw a chic cape into the mix. LBDs are always a wardrobe winner and this lace beauty ticks a lot of boxes. Team with a classic court shoe and as for outerwear, bring your boyfriend coat for that cold walk home. Whether you're off to the pub or having a party with your friends, you want to be comfortable but stylish too. This forest green frock covers both grounds and looks great teamed with a biker jacket and shoe boots. All looks from Topshop and Warehouse. What perfect styles! The first and last outfits look amazing and i love them, especially the leather jacket:) They're stylish when you combined them together in ton-sur-ton. Check out my newest blog post about the matching couple clothes trend AKA "Ao thun cap" at áo cặp CANIFA.